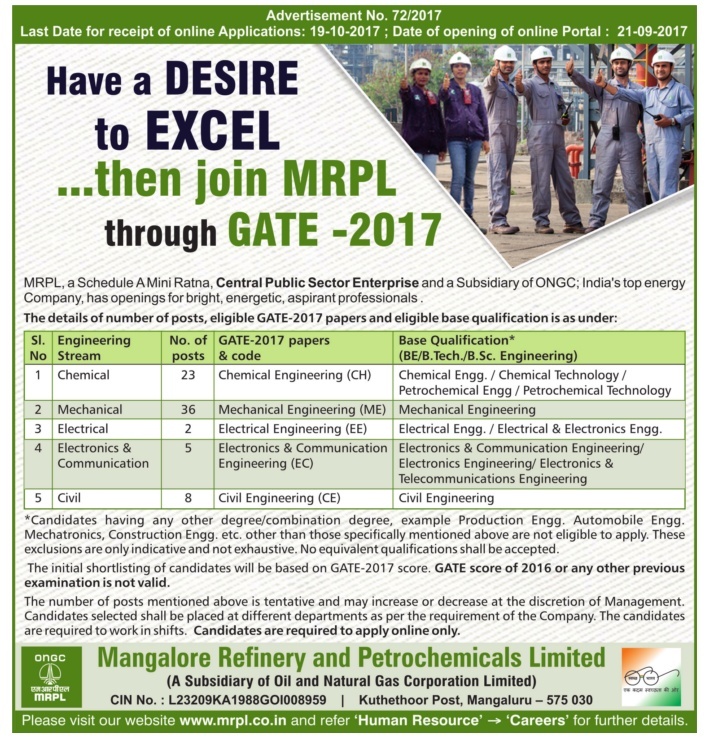 MRPL Recruitment 2017 for Graduate/Technician Apprentice Trainees in various discipline & Executive Trainees in various disciplines through GATE 2017 Score.The detailed eligibility and application process are given in below. How to apply MRPL Recruitment 2017? All interested and eligible candidates can apply for this position in online from 21 September 2017 to 19 October 2017. Candidates who have passed the qualifying examination in the year 2015, 2016 and 2017 only need to apply. Candidates who have completed and possess the essential qualification by 07/10/2017 are only eligible to apply. Candidates who are appearing at the qualifying exam/awaiting result of qualifying exam/who do not have mark sheets and degree/diploma certificate (either provisional or final) are NOT ELIGIBLE for applying. Candidates who have been engaged previously as apprentice/are undergoing apprenticeship training at MRPL or elsewhere under the Apprentices Act, 1961/ Apprentices Amendment Act, 1973(as amended from time to time) are not eligible to apply. The selection process shall consist of written test. The candidates shall be considered for engagement based on the marks scored in written test and subject to meeting the advertised specifications, verification of documents/any other criteria prescribed by MRPL etc. All interested and eligible candidates can apply for this positions in online from 8 September 2017 to 7 October 2017.All interested and eligible candidates can apply for this positions in online from 8 September 2017 to 7 October 2017.